Will the Alphabet Network keep swimming with the sharks? 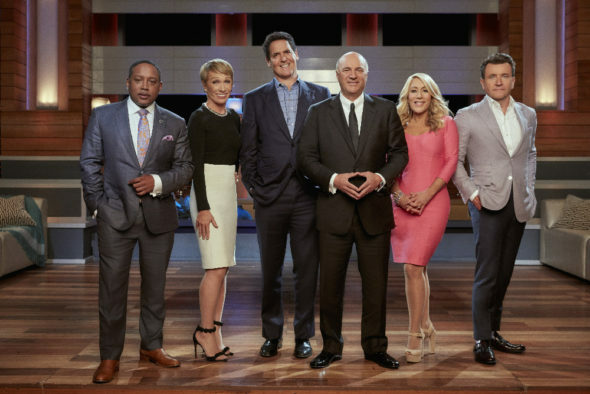 Has the Shark Tank TV show been cancelled or renewed for a ninth season on ABC? The television vulture is watching for the latest cancellation and renewal news, so this page is a dedicated place to track the status of Shark Tank season nine. Bookmark it, or subscribe for the latest updates. Remember, the television vulture is watching your shows. Are you? Airing on the ABC television network, Shark Tank features self-made, multi-millionaire and billionaires on a quest to invest in the best American businesses and products. These “Sharks” give competing entrepreneurs the chance to pitch their businesses, in hopes of scoring deals that could make them millionaires. Mark Cuban, Barbara Corcoran, Lori Greiner, Robert Herjavec, Daymond John, and Kevin O’Leary star. The eighth season of Shark Tank is averaging a 1.18 rating in the 18-49 demographic and 5.18 million viewers. Compared to season seven, that’s down by 17% in the demo and down by 12% in terms of total audience size. Learn how Shark Tank stacks up against the other ABC TV shows. On May 11, 2017, Shark Tank was renewed for a ninth season. Season nine will debut on October 1, 2017 at 8:00pm. Because Shark Tank is a competitive reality series, it is cheaper to produce than a scripted show. Although ABC pays the “Sharks” for their appearances, the money they invest is their own. So, while its ratings have slipped, Shark Tank is consistently one of the network’s better performing unscripted offerings. Barring some ratings-killing scandal or other disaster, expect ABC to renew Shark Tank for season nine. 5/11 update: ABC has renewed Shark Tank for a ninth season. Details here. Find more Shark Tank TV series news or other ABC TV show news. What do you think? Are you glad that the Shark Tank TV show has been renewed for a ninth season? Would you miss this competitive reality series, if ABC had cancelled it, instead? Do not cancel shark tank! It’s my favorite show. Dont cancel shark thank, its my Sh*T!